There’s something so unbelievably beautiful about braids; they’re dainty, feminine, and add some lovely dimension to locks. 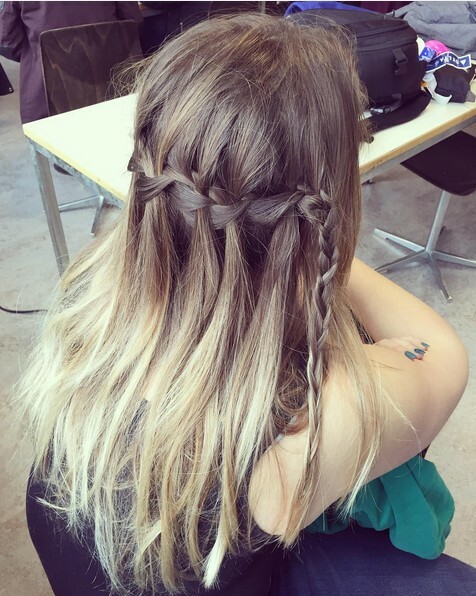 One favored braid style is none other than a waterfall braid, an angled and simply charming style that works for every woman. You’ll fall in love with these delightful styles! How amazing and dazzling is this look!? If you’re ready to fascinate the public with your hair, try out this awesome ‘do. It looks a lot harder than it really is and the outcome is absolutely stunning. 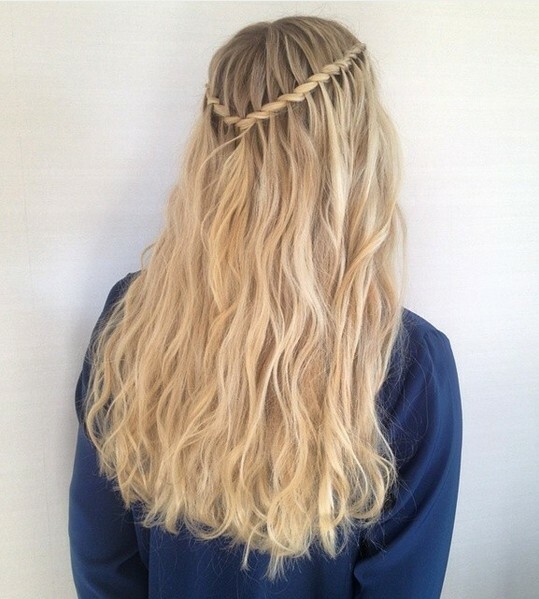 Draping locks locked into a braid created a true waterfall look that is downright breathtaking. Charming dirty blonde ombré with lighter ends tends to leave darker roots hidden in the shadows. 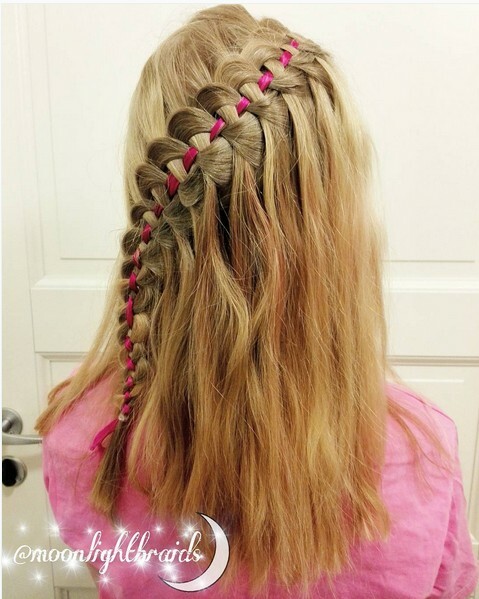 Let those darker hues come forth and be the star of your style with this lovely waterfall braid. It’s an easy hairstyle you can create in just a few short minutes and is a great choice for ombré hair. 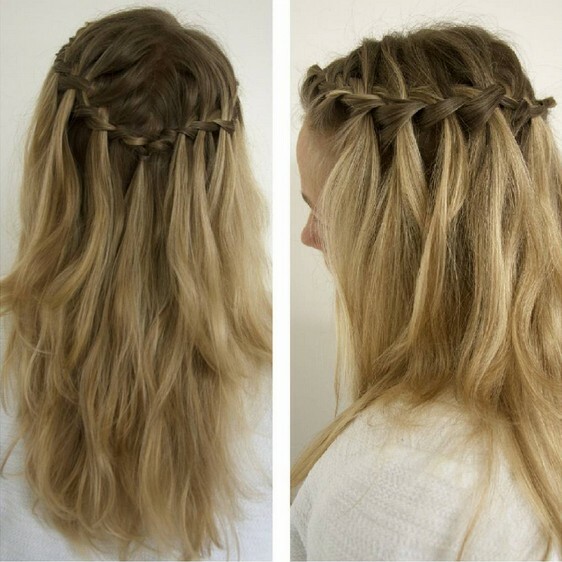 Waterfall braid for short hair: Even short haircuts can indulge in glorious waterfall braids! A flirty side braid is amplified with bold, bouncy curls that add some flirty spice and volume to this look. Great for everyday wear or even fancy events- it’s all in the attire and accessories you choose! Sometimes it’s best to rock those natural wavy locks; but if you’re looking to add a little precision to unkept waves, try a simple half Updo! Double side braids meet in the back while the rest of the mane sports an all-natural wave that’s free and effortless. Great everyday choice for thick, wavy hair. Anything miniature sized is just downright cute, right? 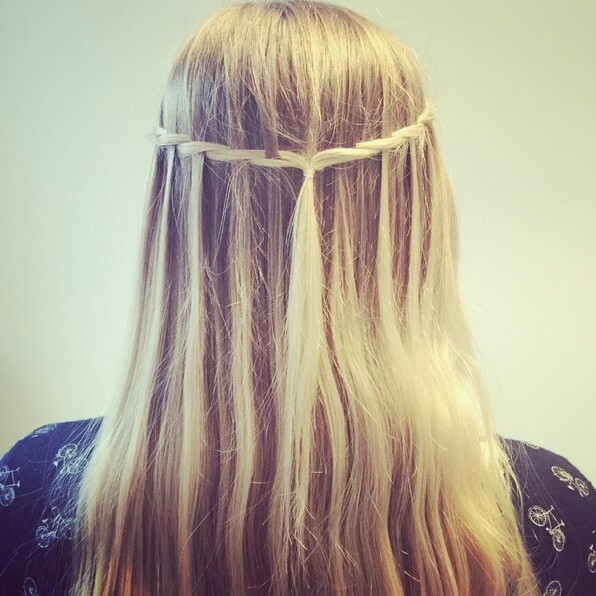 Take that well-known theory to your locks and try out this mini-braid for size. It’s just a little cute thing, but it makes a diligent impact for some cutesy dimension. 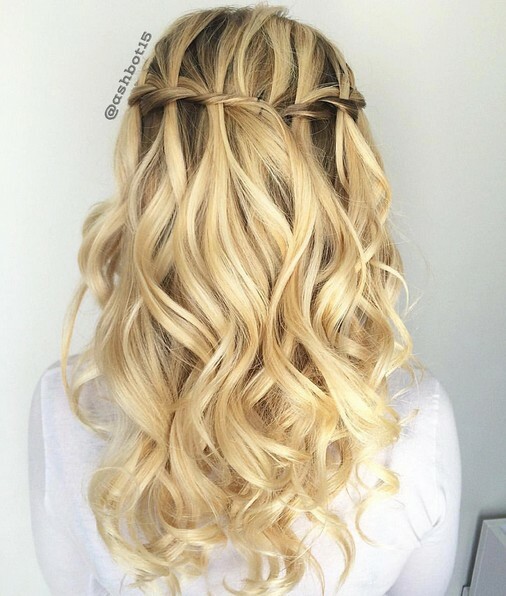 A unique black and golden blonde ombré hair coloring is brought to life with this elegant hairstyle. 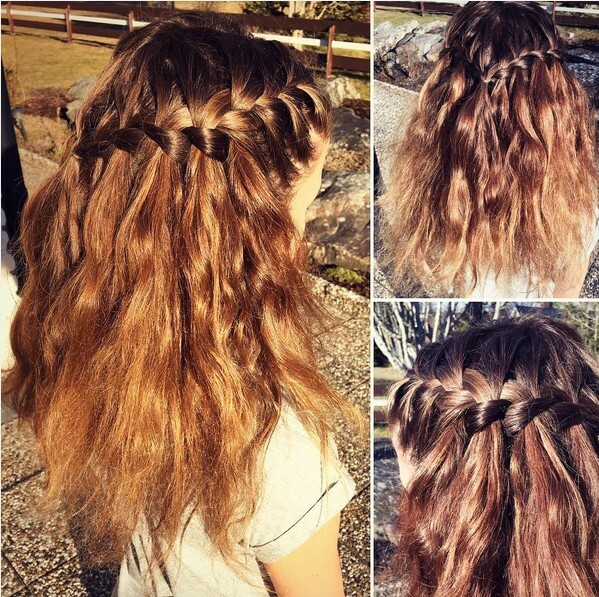 A trendy waterfall braid let’s those contrasting colors shine bright, leading down to a sophisticated side bun that’s left tight with precision for a polished look that’s perfect for fancy events. Oh, so cute! This adorable look features a chunky waterfall braid that finishes off to the side, with a complementing fishtail braid for added cute dimension. It’s an everyday look that pairs easily with any wardrobe. When you’re in need of a casual look that’s oozing with feminine class and sass, consider this charming look. 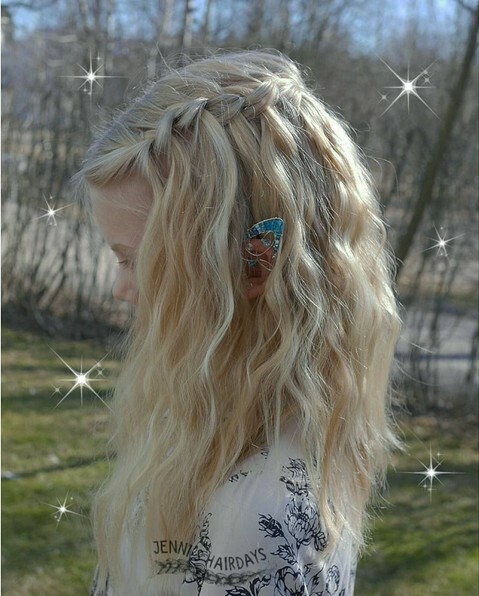 A lovely waterfall braid wraps around her crown, with the rest of her mane waved to perfection. 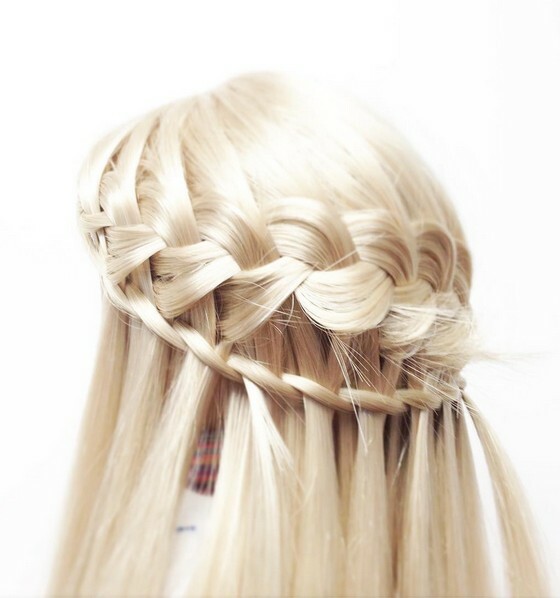 Switch up your favored waterfall braid by using a twisted braid instead of a traditional or fishtail. Leave the rest of your locks wavy and effortless for a natural looking style with a slight bohemian feel. Half updos are perfect for those days where you want to pin up some of your locks, get those loose strands away from your face, ano let the rest of your tresses run freely. This charming style features two side braids leading back to a half Updo where the braids are tight up into a loose knot. A really easy look that’s great for school or work. Wowing the crowd is easy when you’re wearing a hairstyle like this! Chain braids add some seriously unique elegance to this look, amplified with some loose ringlets to lock in that lovely look. A perfect match for your most regal attire and light makeup shades. Late for school? Don’t fret! 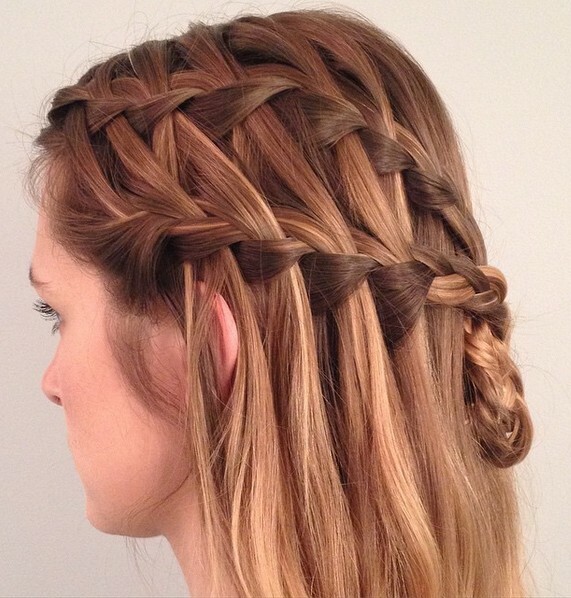 This is a classic waterfall braid hairstyle you can throw together in a matter of minutes. Even if you didn’t have time to shower or straighten your locks in the morning, this look takes boring drab hair to the next level with ease. 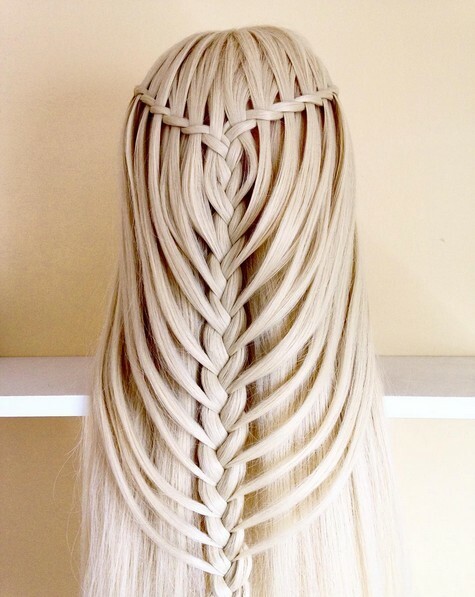 Why settle for just one braid when you can have four? Add an extra dose of style and flair to your hair by indulging in quad side braids. Clip them together at the back and let the rest of your tresses dangle freely. This hairstyle is a trendy trio that’s oozing with seductive shades! 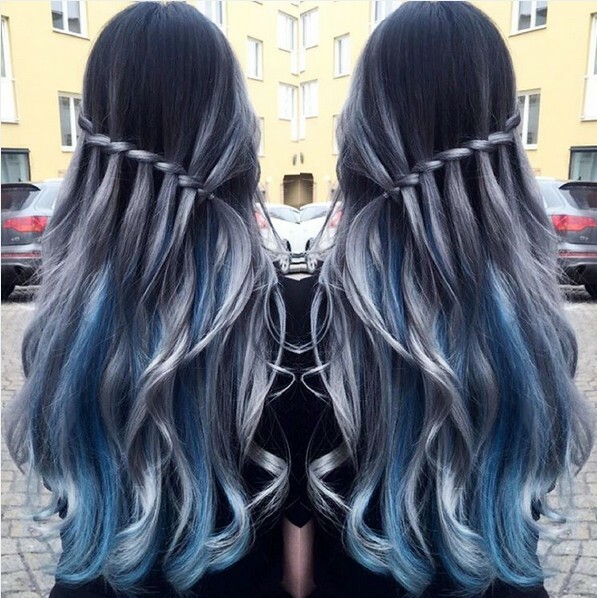 A black base is lightened on the ends with sultry greys and vibrant blues, hues that are a delightful blend of mystery and exotic attitude. The cascading braid separates a straight top half from loose ringlets below, creating a marvelous style that’s as flawless as it could get. 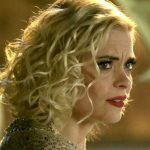 So in love with this fab ‘do! 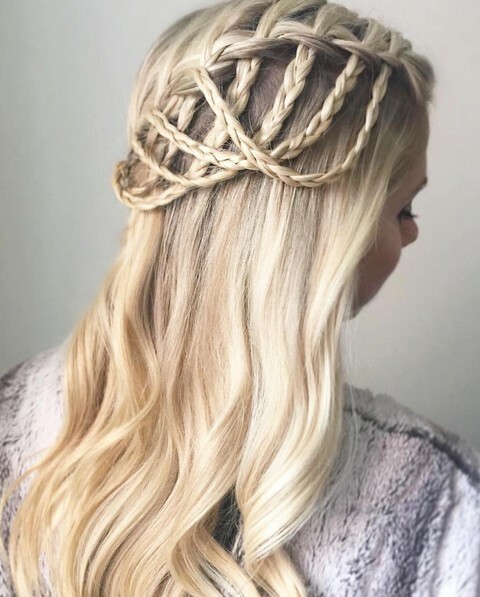 Hair that is a single tone with no highlights or lowlights may lack dimension, but there’s one easy way to add depth to one-toned locks: braids! Here we see a thick chunky braid complemented beautifully by a miniature sized braid, a duo that’s refreshing and perfect for summer. Braids galore! 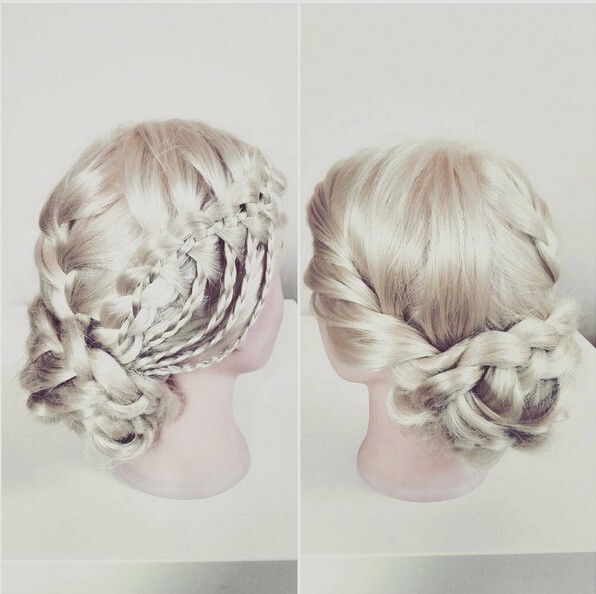 Boring updos? Forget about it! 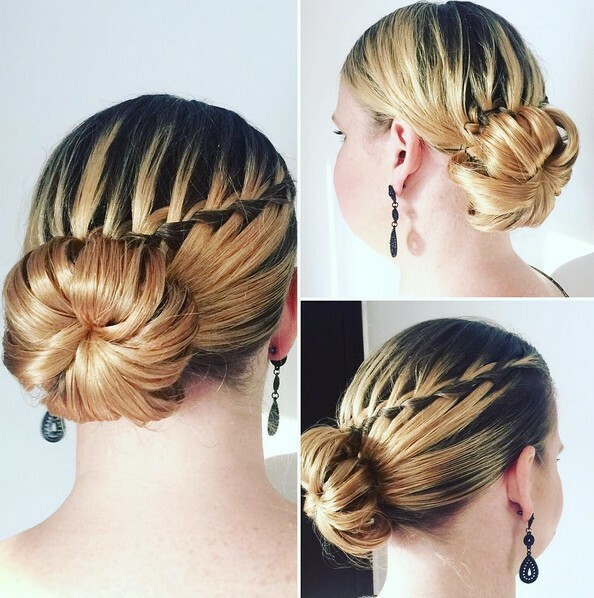 This stylish and sophisticated number is loaded with braids of all different shapes and sizes, leading back to a glorious braided chignon that’s both elegant and appealing to the eye. For a bold updo that’s loaded front to back with depth, consider this heavily braided style. Super cute for younger girls, and a great way to shake things up a bit. 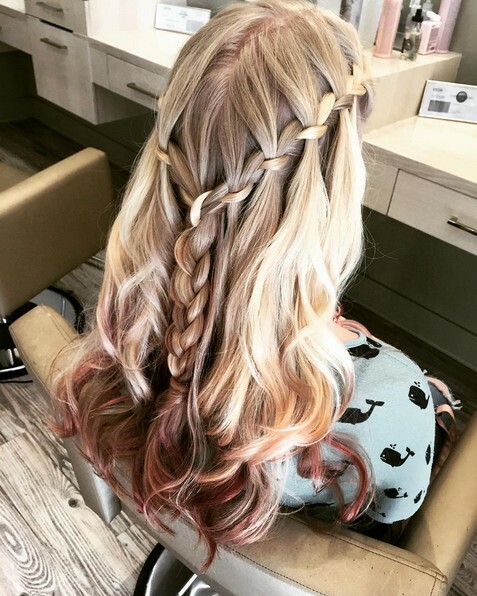 Adding just a single ribbon to interlock with your waterfall braid is such a cool and cute way to spice up your look with some color. Any color will do- mix and match to suit your style! Braids are adorable and feminine, but what’s even more feminine than that? A flower! 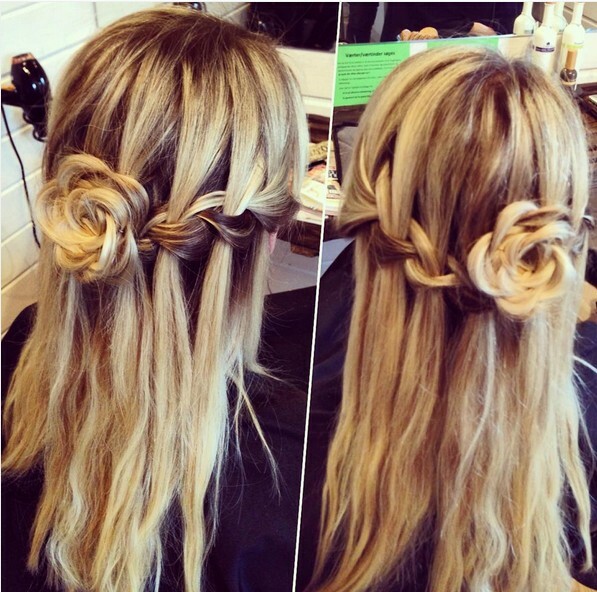 Create even more feminine attitude in your mane by designing a flower right inside your braid. Such a cute look! Refinement, grace, and class were the three main focuses of this stunning hairstyle. 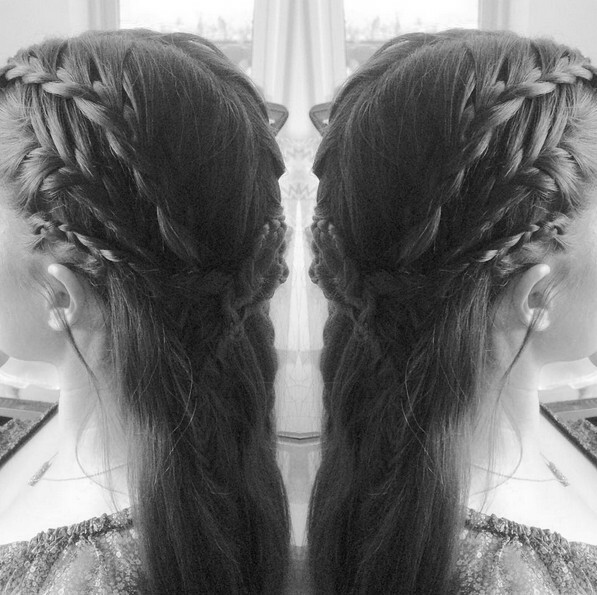 A pint-sized wrapped braid is styled around the crown, creating some flawless dimension to her elegant look. Glorious loose ringlets seat the deal on this polished style, just perfect for high-class events. Adding unique shades to your Ombre is an awesome way to switch things up! This dazzling blonde ombré is completed with mahogany ends; and there’s only one way to make these colors pop- with loose curls! 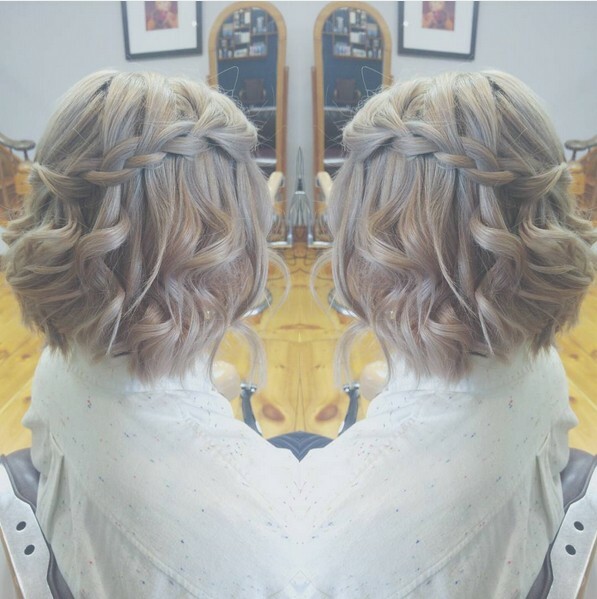 Add a waterfall braid tied into a gorgeous half Updo with lovely classic three-strand braid in the center for cute contrast and depth.